This is a free fun game that is perfect for any wedding related party, whether it is a bridal shower or a hen's party. 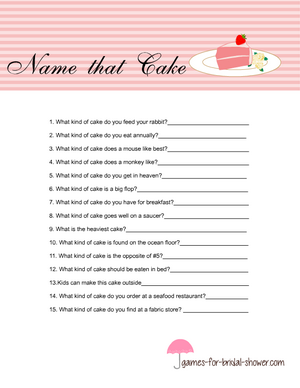 Your guests will have to guess the names of 15 different cakes from the hints provided on each game card. 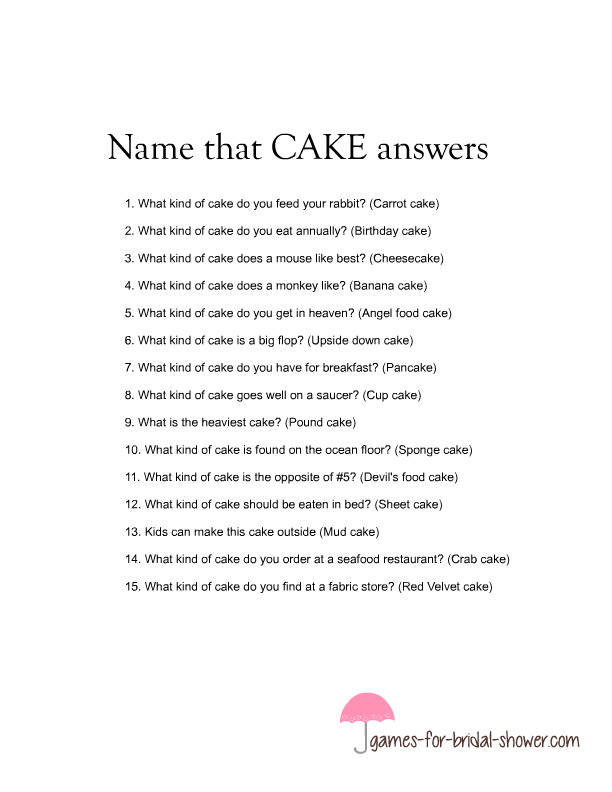 Check how much knowledge do your guests have about cakes by printing these game cards for them. Click here to download the solution for this game. 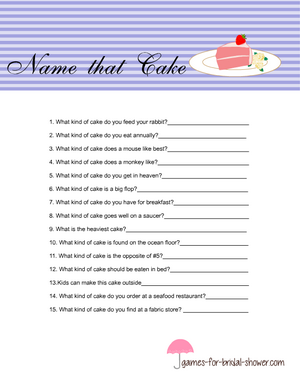 How to Play: Print these 'name that' cake game card according to the number of players who'll be participating in this activity. Distribute the printed cards among the guests along with a pen or pencil. 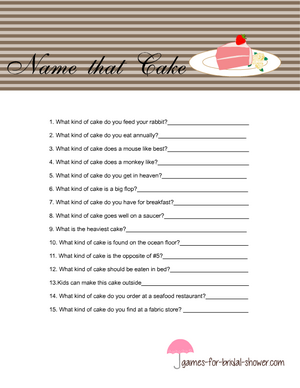 Ask them to guess the name of the cake by reading the hint given on each line. They'll have to guess the names of 15 different cakes. The person who'll guess most names correctly will be the winner. Click here to download the answer key. Click on the thumbnail image for this game that you'll be seeing shared above. This will open the bigger printable sheet for this quiz. This game is fun to play and I have made different cute designs for each games. This game card is decoraed with light and dark pink stripes and a piece of cake in a plate. The name of the game is written at the top in a beautiful font. 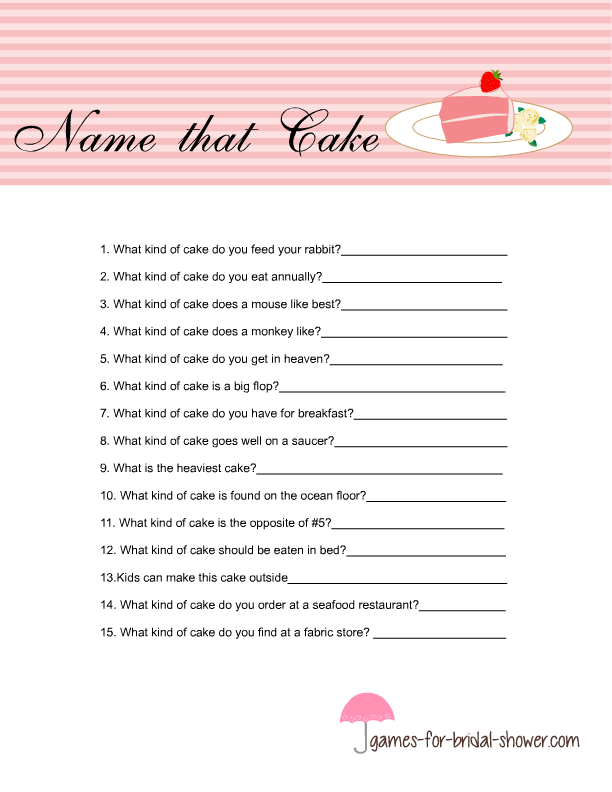 There are numbered questions on this printable sheet so you can easily check the answers, after your guests have finished writing. I make beautiful printables for my games but also make these designs in a way that printer wont consume much ink. This game card shared above has a beautiful purple header and a white base. The header is decorated with a cute piece of cake. Just click on this image shared above and a bigger printable game card will open up that you can print. This is the third and also a very beautiful color for this game. 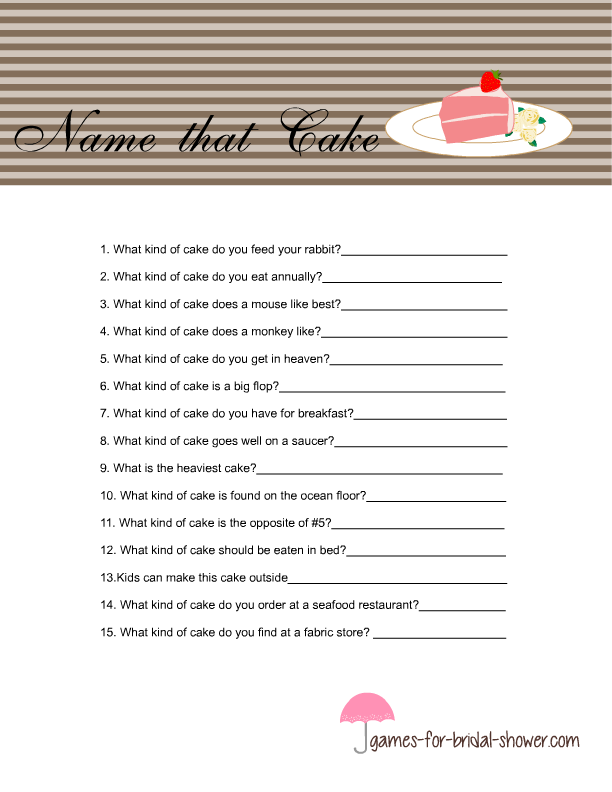 This game sheet has a light and dark brown striped header and a cute piece of cake as in the printables above. Just click on this image and save the bigger PNG image that will open up.